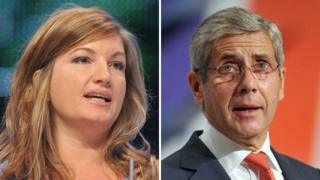 Football boss and Apprentice TV show star, Karren Brady, is among 22 new peers announced by the government. Ms Brady will take a seat on the Conservative benches in the House of Lords alongside former Marks & Spencer chief Sir Stuart Rose. Other new working peers include former MEP and EastEnders actor Michael Cashman, who will become a Labour peer. There are 12 new Tory peers, three new Labour ones, six Liberal Democrats and one DUP member of the Lords. This takes the total number of peers to 796, compared with 650 MPs in the House of Commons. No UKIP peers were appointed despite a coalition agreement pledge to reflect the 2010 general election vote share in Lords appointments. Conservative donor Ranbir Singh Suri is among those being lined up for a seat in the Lords. The jewellery tycoon and his company have given more than £300,000 to the party since 2006. Another Conservative donor, Michael Farmer, who has given almost £6m to the party since 2001, is also set to sit in the Lords. A Conservative spokesman hit back at criticism of the ennoblement of the two donors. He said: "Michael Farmer and Ranbir Suri are worthy recipients of peerages - Michael has been involved in numerous charities and a successful academy school and Ranbir is a leading member of the British Sikh community and former magistrate." In a statement, Mr Farmer said: "I am greatly honoured to be nominated by the prime minister to become a Conservative peer and very much look forward to working and supporting the government in the House of Lords, in particular in its important long-term work for the economy, and in its ongoing reform of our welfare and educational systems." Two of the former Lib Dem council leaders nominated by Nick Clegg have donated money to their party. Barbara Jenke has given £5,498 since 2010 and Pula Scriven £2,000. Peers are nominated by the party leaders but are vetted by the independent House of Lords Appointments Commission. Ms Brady is perhaps the best-known of the new Lords members and she has been tipped to be given a ministerial job by Prime Minister David Cameron. She started her career in advertising but shot to prominence in 1993 when she was made a board member of Birmingham City Football Club at the age of 23 by its then owner, Sunday Sport tycoon David Sullivan. Media captionMichael Cashman: "It's a huge and humbling honour"
In 2010 she was appointed vice-chairman of West Ham United and also joined the BBC's Apprentice as one of Labour peer Lord Sugar's advisers. She was previously a board member of Mothercare, Channel 4 Television and Sport England and is currently a non-executive director of retail giant Arcadia. She has also taken on the role of small business adviser to the government. Sir Stuart, who worked his way up from a management trainee to head Britain's biggest High Street fashion retailer, has been advising the government since February on how to turn round failing NHS hospitals. Mr Cashman found fame playing Colin Russell, the first gay character in the BBC's EastEnders, before going on to be a Labour member of the European Parliament and co-founding campaign group Stonewall. He stood down as an MEP this year. Commenting on his elevation to the Lords, he told BBC News: "It's a huge and humbling honour. And it really takes me back to my roots. I just wish my old mum and dad were alive to see it. "And it gives me a huge opportunity to continue the work that I am passionate about - international development, human rights and giving a voice to the voiceless." Former Conservative MEP Martin Callanan said he was "very happy" to be made a peer. He was leader of the Conservative group of MEPs before he lost his seat for the North East of England in the European elections. Mr Callanan said he was "happy to take up the offer" of a peerage because "I want to remain involved in politics". The Democratic Unionist Party has nominated William Hay MLA, the Speaker of the Northern Ireland Assembly, who has chosen to sit on the crossbenches.